"We set the new standard. We would like to have every drug from now on to have such an impact on overall survival like Palbociclib did." Breast cancer survival rates have been improving since the 1990s, but there's still a significant need for new therapies. Every year, more than 40,000 American women die from breast cancer. Dr. Massimo Cristofanilli has exciting results from a phase three clinical trial he led, published in the New England Journal of Medicine, that shows improved survival rates for women with common forms of advanced breast cancer. Not only are the women living longer, there is meaningful clinical survival improvement, because use of the drug improves different measures of quality of life. Read more about the study, which was published in New England Journal of Medicine. Erin Spain: This is Breakthroughs podcast from Northwestern University Feinberg School of medicine. I'm Erin Spain executive editor of the Breakthroughs newsletter. Breast cancer survival rates have been improving since the 1990s, but there's still a significant need for new therapies. Every year, more than 40,000 American women die from breast cancer. 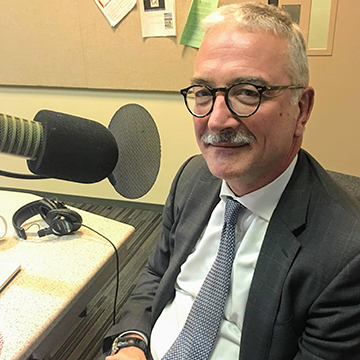 Dr. Massimo Cristofanilli is here with some exciting results from a phase three clinical trial published in the New England Journal of Medicine that shows improved survival rates for women with common forms of advanced breast cancer. He is the associate director of translational research here at the Robert H. Lurie Comprehensive Cancer Center of Northwestern University. Thank you for your time today. Massimo Cristofanilli: Thank you for having me. Erin Spain: So October is breast cancer awareness month and experts like you going all over the country presenting new findings, attending conferences, and I'm curious, you know, what is the state of breast cancer today in America, in the world? Massimo Cristofanilli: Breast cancer is one of the diseases where we have really made major strides against, particularly due to the fact that there's been a lot of funded research, so understanding the biology to decease, applying appropriate technology to discover the molecular drivers in particular having new drugs to treat the advance forms of breast cancer. Someone of these drugs, of course made it all the way back to the early disease, so we have seen a dramatic improvement in survival for a number of reasons. We know early detection has an impact. We know also that improving the management in the adjuvant setting after a primary surgery has an impact at this point. We over in deescalating chemotherapy for patients that do not need because we better understand which patient have a more aggressive disease. In advanced disease, patient with metastatic breast cancer, no doubt live much longer with no symptoms. This is due primarily, as I mentioned to the understanding of the disease and the availability of new drugs that we can offer to our patients. Erin Spain: But there's still work to be done. Massimo Cristofanilli: Yes, as you mentioned, 40,000 women are still dying of advanced breast cancer. Many of these women have aggressive treatment-resistant disease, and they're younger than they used to be. So, this is an obligation really to experiment even more to find better treatments. And I can tell you that our major focus now is for triple negative for younger women. Having drugs that improve survival is a very difficult and challenging call for every new drug. In fact, most of the drugs that we have available in breast cancer have been approved primarily because they prolonged disease control what is called the progression free survival and very few, if any, has shown a survival advantage in women that have been treated with a specific type of drug. So I think that's the reason why we are excited about this data. Erin Spain: You said that women seem to be diagnosed younger now. Why is that? Massimo Cristofanilli: Well, there is, I think a number of factors. Of course a disease can be based on genetic predisposition. We know that BRCA1 and BRCA2 and some other predisposition genes, put the women at risk of developing breast cancer and early age and these tumors are naturally more aggressive and sometimes resistant to standard treatments. Some disease subtypes are more common in African American women naturally also younger African American women and they don't always have the ability to access new care and new treatments. And certainly there is a biology that we don't understand yet. That could be a number of other factors that contribute to the disease become aggressive even if it's estrogen positive in younger women. Erin Spain: So you mentioned estrogen positive. Could you just go through some of the most common types of breast cancer and how they're treated today? Massimo Cristofanilli: Sure. So the three primary markers that we use in understanding and dividing the type of breast cancer are estrogen, progesterone and F2 oncogene protein expression. Once we have stained the primary tumors with these particular three different administered chemical staining, we divide this breast cancer into different subtypes. More genetic, the luminal subtype with the estrogen positive tumors; the triple negative subtype, negative for all three, and the F2 positive subtypes. These have important implications in terms of treatments. If you're talking about primary tumor that was just diagnosed most of the patient we have surgery, plus or minus radiation depending on the size of the tumor and other factors. It may receive chemotherapy after, in particular for the triple negative or the F2 positive. With the F2 positive together with antibodies targeting the F2 proteins. And the patient with the F2 positive are special group and actually the most challenging in some cases because some of them will not need chemotherapy because they are less aggressive, some others more aggressive and in spite of chemotherapy and endocrine therapy, they may have a recurrence over the years and sometimes it is occurrence that happens after five years. So we definitely have a these estrogen-positive subset or luminal subset, as the major area of development, because it's the most common. More than 60 to 65 percent of the patients with breast cancer, have an estrogen positive tumor. So as I mentioned, they receive primary therapy and at some point they many have a recurrence. So for us, developing new drugs for estrogen positive tumors that have a recurrence, is an important task because these are the drug that is going to affect the majority of patient with breast cancer likely contribute to decrease in mortality and improve survival. Erin Spain: And these are the women who are involved in the clinical trial, PALOMA-3, that you just have these results that have been published. Tell me a little bit about these women, why didn't they respond? Why was there a relapse? Massimo Cristofanilli: So, I was mentioning that patients with primary breast cancer start to take a pill and endocrine therapy after they finished surgery, and sometimes chemotherapy. I didn't take this agent for controlling the disease in the studies for at least five years. During this time though, some of the cells become resistant in the tumor can come back in very common sites, like the bone, the lymph node or other organs. In some cases, this recurrence happens earlier and the patient started a new treatment that is still an endocrine therapy and if they don't respond, they need to move on to other therapies. So the PALOMA-3, was a study that was designed for patient who were premenopausal or postmenopausal and failed one of these agents, either they were taking after surgery for a given purpose or after they have recurred in the metastatic setting, that's was obviously a challenging situation. So they are become endocrine resistant. And we wanted to prove that if you were to take in these new drug Palbociclib together with a common second line endocrine therapy, uh, the drug was effective in prolonging the disease control a comeback compare to the other single agent drug, alone. So the study was already published in the first endpoint. The first primary endpoint was to prolong the progression free survival. And this was the first data were published in the New England Journal in Twenty 15. And we sold that the drug was effective, well tolerated, and there was an improved response. All the signs were associated with a major benefit. So it was approved by the FDA and it was an extended labor. We continue to follow this patient and we wait a number of events, a number of women that have a somewhat progress and eventually fail every therapy. So now we have the data regarding the survival of this patient in the two arms of the treatment. The one that received the palbociclib, we know for how long they continue in the palbociclib treatment, what happened after that and eventually how they are doing, for the other arm as well. So we have the ability to tell what the palbociclib did to the overall disease over time. A median follow-up with this patient was 44.8 months, so a relatively long time. So this is the first report that we have, with regard to the overall survival, not only for the palbociclib for a phase three, but for every phase three there was done in this particular population with this class of drugs. All the other studies, are not mature enough to have an overall survival data. So the study enrolled 521 patients that were randomized into two groups, we say this is a randomization a two to one. So, the majority of patients, the active combination compared to the single agent with placebo, and they were stratified based on the fact that they had a progressed after a long time from a prior endocrine therapy or they have responded to the first line of therapies. We will defined this endocrine sensitive even though their progress and the other group would define endocrine insensitive and we're looking at other secondary end point. So we knew that the study was not large enough to be able to answer the question with regard to the overall survival, so this was a secondary endpoint. The primary endpoint was still looking at the progression free survival. Erin Spain: Okay. So you knew that the drug was effective, but now how does it impact survival? How much longer is the survival rate for these women? Massimo Cristofanilli: Right. And this is, as I mentioned, is a very challenging point for every study of metastatic disease. In particular for this patient with endocrine therapy because they received multiple lines of therapy, other drugs after. So we look at this and, uh, who were able to essentially demonstrated this with other show that with this 44.8 months of follow-up there is a difference, an absolute difference almost seven months in survival between the two groups. Erin Spain: Between the people that got the placebo versus the ones that have received the drug. Massimo Cristofanilli: Correct, so the group of patients that received the medication had a median overall survival of 34.9 months compared to 28 months. And this is remarkable, as I said. The other end point that will look at, because as I mentioned, it was a stratification to look at who would benefit the most, essentially the majority of patient with benefit, but the patient and benefit the most were, the one that at some point have shown a response to the endocrine therapy. So that we're not completely refractory to endocrine therapy and this group of patients, the overall survival difference was 10 months, so very remarkable, very statistical significant. The median overall survival for the group of patient that received the drug was 39.7 months, so we're talking about metastatic disease, you see that we have patient that go well over the standard survival that we know and recommend to patients and the full vest term was 29.7 months. Not only that, we also measure a number of other endpoint, so for how long the medication was assumed by the patient, for a long, they stay in the study. So the patients who were taking palbociclib, we're taking this medication for a median of 11 months compared to only 4.6 months. This means that if you were treated with just with the endocrine therapy shortly after you start just a little bit more than four months, you had to stop that and think about the new treatment. And this new treatment was most of the time chemotherapy and you were going from one treatment to another because there was not a very effective drug at that point. And this was instead the group of patients treated with palbociclib, it was a median of 17.6 months before they were to go to chemotherapy compared to 8.8 months. So these women had the normal life for much longer time. Not only was their survival was prolonged but the quality of life was improved and this was measured very carefully in this study and was published in prior study. We showed these women had symptom improvement, their mood was better, they didn’t have major side effects. So, imagine taking chemotherapy requires a number of measures, chemotherapy makes you sick, chemo brain, white count, risk of infection and so forth. So I think it is relevant to consider and putting everything in the right perspective that you have a prolongation of quality survival. And then we look at also the type of treatment that we every patient receive after and the patient continued to respond to the next treatment without having any impact from the prior treatment. So in essence, this is a meaningful clinical, survival improvement because we improve different measures of life, quality of life. Patient were delaying chemotherapy and were staying on the drug for longer time and when they start the next treatment, they continued to respond to the next treatment. So that's one of the reasons why we feel this is a remarkable result. We set the new standard. We would like to have every drug from now on to have such an impact on overall survival like palbociclib did. Erin Spain: This is pretty much the gold standard when it comes to clinical trials to get to this phase three and then to have results like this. What has been the response from your colleagues in the community who have heard of these results? Massimo Cristofanilli: The majority of clinicians feel very strongly about using this drug already and they feel that they are now certain of the right direction when they see this data, supporting the use of this drug in this a refractory resistant disease setting. Of course, patients and patient advocates will be extremely happy about this because I think this is one of the first few times when a drug made a study showing a survival advantage. So who would not like to see this without major side effects? The purest, people that are a little bit more into the details of statistics, will think that because we have not reached officially statistical significant in the overall population, maybe we needed to have a larger study to reconfirm it. But I think in this case we provide enough evidence that not only statics is counts, but the absolute data and the combined clinical effect is remarkable and there is no doubt it's going to be making a difference in establishing your standard of care. Erin Spain: Palbociclib is FDA approved right now and some clinicians are using it in their patients. Massimo Cristofanilli: I think the majority of clinician in the US are using it. Sometimes, especially early on, physician felt that because this was a drug that was a little bit more potent than standard endocrine therapy, they could delay the use of this drug, but I think this data strongly recommends against it. Erin Spain: Well that's another question I have. So I'm in this particular group, in the clinical trial, these women had advanced forms of breast cancer. Could this drug be used early on? Massimo Cristofanilli: Yeah, that's a good question. In fact, the drug is being tested right now in women who have completed surgery and you're receiving adjuvant therapy and the goal is to prevent that resistance that brought these women to need a drug in the advanced setting. So the idea is that if you have a very effective drug in the metastatic setting or you move into early setting, probably you can reduce the number of metastases to develop and that will be even more important and contribute even more to reduce the death patients for breast cancer. Erin Spain: This was an international study, correct? Erin Spain: So they have sites all across the world? Massimo Cristofanilli: All across the world, they were 44 investigators all over the world. So, it means also patients participating all over the world. I think we are very excited to be leading this study and of course to see these results. Interesting enough, sometimes the access to the drugs is not available across the rest of the word always at the same time. I think this data would be even more compelling for the healthcare system that cannot afford to approve this drug. Erin Spain: What typically happens in the medical community when results like this come out? Massimo Cristofanilli: Of course, we are excited about what we have, but we're not satisfied because there is still a fraction of patients eventually progress even to this treatment. So we're trying to better define what additional treatment we need to incorporate in the management of patients with advanced breast cancer. We want to eventually, if possible at some point, to eliminate chemotherapy and in order to do that we need to better study the biology of the disease, what these resistant tumors really are about, having new drug to effectively block this resistant pathways. And, and as I say, hopefully this management of breast cancer becomes management of a chronic disease. That women can live for a long time without major side effects, without having to really be too much concerned about what's going to happen with them tomorrow, especially as young women that we are treating right now. Erin Spain: So you're actually an international expert on the treatment of patients with inflammatory breast cancer, which is a rare breast cancer that may present differently than a lump in the breast. Tell me about the symptoms of IBC and how your patients do with treatment. Massimo Cristofanilli: I'm glad that you gave me the opportunity to speak about the inflammatory breast cancer. It is considered are usually rare, but I think all the statistics suggest is also misdiagnosed and the reason being that these women wake up in the morning with a swollen breasts in skin changes in the breast and because this happens so rapidly, the first diagnosis is a mastitis infection, so they get treated with antibiotics. The problem is they go to primary physician, they go to OB-GYN physician and they don't know about it. It says they think is a mastitis and sometimes these women get treated with antibiotics for a long time. In reality they get to the point they do a mammogram, a MRI biopsy, and they find out that they have a cancer. This cancer never has an early stage, it is always at least a stage three and 40 percent of the case can be a stage four. So, you understand that if you diagnosis is delayed, there is a higher chance that you have a stage four disease. So these are tumors that are extremely aggressive. They can now be treated with surgery upfront, they need to receive chemotherapy or definitely combination systemic therapy in order to reduce the size of the tumor, improve the skin. They need to have a mastectomy all the time because the skin is involved and there is no lump most of the time and they need to do extensive radiation in the chest wall, they need to continue treatment in the adjuvant setting and sometimes for a longer time in spite of giving standard therapy. A good number of them had a progression in the first two or three years when it comes back and come back on the chest wall, skin rash, lymph node, organs, bone disease, sometimes brain metastasis. So, there is a need to understand better why this happens. I think there are a few centers in the US and other international that are studying this disease now for quite some time. There is not much funding and not much talking about, there's not much education. We still see a patients that are either misdiagnosed, have delay, diagnosis or they have a recurrence because they did a surgery that was not proper or they didn't receive enough radiation. A number of a situations, certainly contribute to make the life of these women even worse and usually they are younger than the others. Erin Spain: They seek you out from all over the world. Do you get phone calls, emails, messages from women who are recently diagnosed with us? Massimo Cristofanilli: Yes, correct. We do have also an IBC International Consortium with a website and we try to make sure that we coordinate the research and also the clinical trials if possible. And because they know who are the experts or where they are, so we to see a number of patients. My clinic tries to reach inflammatory breast cancer patients and we try to help as much as possible. Erin Spain: What can you tell physicians, OB-GYNs, primary care physicians, to look for to spot this early. How can they help you treat these women? Massimo Cristofanilli: So the first fact to consider is, this is not a skin problem, it is a breast problem with some skin rashes and skin changes that are very well described and usually happens very frequently. Mastitis is a medical condition that happens when women lactate, so when you have a postmenopausal woman that has no sign of infection there is no reason to think about mastitis, so you should refer to a breast specialist, to do some additional workup. Sometimes because there is not a mass, the mammogram, not only is uncomfortable but also doesn't see what the disease problem is, So usually an MRI is the best imaging tool. So be suspicious, I think for every physician who has a woman that comes to day office complaining of swollen breast, a red breast and has no other reason to have that factor, think about inflammatory breast cancer. This is a breast cancer without a lump and as a I'm not considered a properly in the context of what we recommend. Everybody talks about locally advanced and not inflammatory. Inflammatory is a different disease, locally advanced is the one with the lump grows over time and can take months or years, this one appears very quickly. So try to make the appropriate referral for patient to a specialist. Don't try to manage if you're never seen and unfortunately we see also breast specialist, who have never seen. This happens in the community especially. I think this is like, imagine leukemia, you would never try to manage in your office. Probably not. So don't try to manage inflammatory in your office. Trying to send to referral for appropriate workup. Erin Spain: Is there anything else you would like to add? Especially this being October, there's so many symposiums and conferences taking place. Massimo Cristofanilli: I like to have a dedicated breast month, but I really think that we need to continue to focus on breast cancer health, quality of life and drug development all the time, because that's what our women, our patients need.